One of the pleasures of running your own blog about country houses is that you get to play favourites. I’m often asked which is my favourite but this is a difficult one to answer; is it the one I want to live in (currently Bragborough Hall, Northamptonshire), the one I most want to visit (Mereworth Castle, Kent), or one that I think is just stunning (Bruern Abbey, Oxfordshire)? However, there are some which just hold a special affection – and that, for me, has to be Mamhead House in Devon, partly for its beauty and also for no better reason than it having been local to where I grew up. Mamhead’s main claim to fame is that it was the project which established one of the best Victorian architects; Anthony Salvin (b.1799 – d.1881). Described as a pioneer of Gothic Revival architecture, Salvin could be seen as the secular equivalent to the religiously driven Pugin. Both sought to restore Gothic as the traditional form of design most suited to the nation, but whereas Pugin saw this as a devotional mission to return Britain to how it might have been had the Reformation never occurred, Salvin saw Gothic as the form which was best suited to our landscape and aesthetics. Salvin’s historically rigorous approach saw him create some of the most interesting country houses of the Victorian era – and Mamhead is a rare example which has now been restored to its former glory. According to Mark Girouard, Salvin’s reputation appropriately rests on his country houses, dismissing his churches as ‘seldom interesting‘, and that it’s ‘hard to regret‘ that his designs for larger buildings such as the new Houses of Parliament and the Carlton Club were never built. However, in the sphere of the country house; his success rested on his ability to combine three elements; “the domestic or castellated architecture of the Middle Ages and the Tudors; the design techniques of the Picturesque; and the needs of the Victorian upper classes“*. Salvin specialised in the restoration and modernisation of ancient buildings, building on a precocious interest in medieval architecture which saw him elected to the Society of Antiquaries in 1824, aged just 24. His obvious scholarly talent marked him as someone to watch but it’s still unclear exactly how he secured his first commission at Mamhead – especially as he replaced a more experienced architect whose plans he then had to adapt. 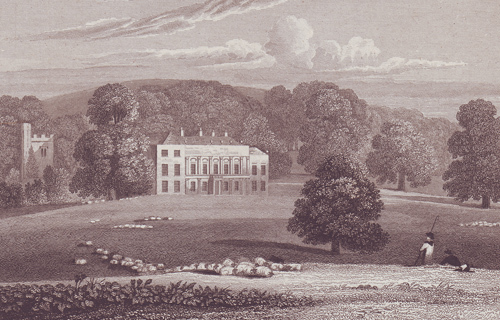 The owner, a merchant called Robert Newman, had commissioned Charles Fowler, who had designed a classical house to replace the existing house (altered by Robert Adam for the Earl of Lisburne in 1774), which Newman appears to have decided not to proceed with, possibly seeing the winds of fashion shift towards the Gothic. He may also have been influenced having seen Kitley (now a hotel), also in south Devon, which had been remodelled by George Stanley Repton between 1820-25, in one of the first attempts at authentic Elizabethan. This change of heart gave Salvin his opportunity. For Pevsner, Mamhead was the house which established Salvin as the chief Victorian architect for large country houses in the Tudor style. Salvin was constrained in that he was working from the existing symmetrical plan and denied the chance to introduce the projection and recession of elements so traditional with Gothic. However, this plan does have tradition in that it has the feel of an Elizabethan E-plan house; though one where the main door has been moved to the corner rather than the expected middle. These minor quibbles were to be later offset by the masterly later additions. Mamhead’s cost of £20,000 was financed from income, so although work started in 1827-8, the final interiors (strangely being the entrance hall) weren’t finished until seven years later. During this time Salvin’s knowledge and experience grew – not least through his second commission for a new country house; Moreby Hall in Yorkshire, built between 1828-32. Here he enjoyed a freedom to create and developed his own arrangement of a central, two-storey hall off which came the main rooms and which also allowed warm air to circulate – not only visually impressive but also practical. It was perhaps the later additions of stables and the conservatory at Mamhead where Salvin clearly demonstrated the flair which marked the original thinking of a great architect. Rather than continue strictly in the same style, the stables were now to be housed in a mock, red sandstone castle, modelled on Belsay Castle in Northumberland, slightly above and behind the house, with the conservatory in a more correct Gothic design. The conservatory is a beautifully elegant single-storey extending from the north-west of the main house featuring four Perpendicular windows leading to a two-storey pavilion leading to the garden. The skyline features many pinnacles with an interior decorated with carved scrolls and verses, shields, and carved panels – all in stark contrast to the rather severe fortifications which Salvin chose for the stables at the other end of the house. Mamhead is fascinating as it not only shows early brilliance in an architect’s career but unusually also is a house which shows all the styles in which he worked – both the Gothic and the fortified. Salvin’s skill with the Gothic form and vocabulary perhaps found its greatest expression in his third country house commission: Harlaxton Manor in Lincolnshire; a fantastical composition which took full advantage of its location and the wealth of the owner. “Harlaxton must be seen to be believed and even when one has seen it, it is not always easy to believe it.” said Mark Girouard – and who can disagree? Harlaxton takes the elements of Gothic and Elizabethan but then injects the visual flair to give it a skyline to rival Kirby Hall, Burghley or the lost Richmond Palace. The house is almost theatrical but coherent enough that the look isn’t overwhelmed by any element. Inside, the most spectacular feature is the famous Cedar Staircase which seeks to match the outside with an unexpected Baroque interior. The design demonstrates how quickly Salvin’s skills had developed, with the work at Harlaxton starting just three years after Mamhead. By contrast, Peckforton Castle would be recognisable to a medieval knight as a useful fortification. Rising prominently above the relatively flat Cheshire countryside, the imposing red sandstone castle is very much in the tradition of Burges‘ Castell Coch for the Marquess of Bute, and the later Castle Drogo by Lutyens. However, a significant difference is the much greater degree of historical accuracy, perhaps appropriate considering it was visually challenging the truly medieval Beeston Castle on a neighbouring hilltop, but also to reflect the benevolent feudalism of the owner, John Tollemache who spent huge sums on buildings and homes for his workers. However, the widespread public discontent at that time, with the risks of mobs and rioting, meant that it is also possible that Tollemache chose a castle with the intention that it be defensible. So successful was Salvin’s design that even a critic (fellow architect George Gilbert Scott) called it a “…a perfect model of a Medieval fortress…“. I think Salvin enjoyed the challenge of this design; a rare chance to build an uncompromising castle in a way which hadn’t been necessary for 500 years, fully taking advantage of his encyclopaedic knowledge of fortifications. Today, despite being badly damaged in a recent arson attack, the castle is still a fascinating example of his work. Apart from ecclesiastical work and alterations to existing houses such as Warwick, Alnwick and Dunster castles, he also designed a number of notable country houses including, in addition to those already mentioned: Cowesby Hall, Scotney Castle, Parham Park, Skutterskelfe Hall (one of Salvin’s rare Classical designs), Crossrigg Hall, Keele Hall, and Thoresby Hall, which still survive today. Sadly, Flixton Hall, Campsea Ash High House, Congham High House, Stoke Holy Cross Hall and Hodnet Hall have all either been completely demolished or, in the case of the latter, significantly reduced. Salvin was one of those rare Victorian architects whose work started strongly and just got better. To have the opportunity to purchase the first major work at Mamhead is a rare privilege and one that I hope the new owner will recognise and appreciate. * source: foreward to ‘Anthony Salvin: Pioneer of Gothic Revival Architecture‘ by Dr Jill Allibone which I can highly recommend, and which was very helpful for this posting. This entry was posted in News and tagged anthony salvin, architecture, cheshire, country house, devon, english, estate, for sale, grade-i, harlaxton manor, heritage, houses, listed, mamhead house, peckforton castle, restoration, strutt & parker, victorian. Bookmark the permalink. A gorgeous house indeed. And yet another fascinating, well written post. We are lucky to have this blog. I just returned from a house visiting trip to Scotland which included Mount Stuart on the Isle of Bute. This was an impressive house but far less personal and cohesive than Mamhead House. Mamhead is imposing in a congenial way and still looks like a home. The line between residence and institution in large buildings is often difficult for me and both Mamhead and Harlaxton seem to have succeeded completely. I am also a sucker for a grand conservatory and would love to see a book about such features in great houses. Flintham Hall is , in my opinion, the zenith, but I would love to see the one pictured at Mamhead. Thanks again for the great read! The Orangery, adjacent to Mamhead House, is now also for sale, by Sir Malcolm & Lady Anne Field, for £3m with 60 acres. It’s Grade II* listed (compared to the 1828 Mamhead House’s Grade I) and was built in 1740 for Thomas Balle of Old Mamhead House, as a Water House standing at the top of a cascade, possibly inspired by Thomas Archer’s 1703 Cascade Temple at Chatsworth House. The Mamhead Orangery was probably converted into a Temple as designed by Robert Adam in 1769, with the Grade II* listed gardens being improved in 1778 by Capability Brown. The Orangery later fell into disrepair, but has undergone refurbishment and extension in the last 40 years, with the gardens redesigned by Georgia Langton in 1999 (see NGS). There is now the opportunity to merge these two properties back into a single 224-acre estate, if you have £11m. And the Country Life article from 6 June on The Orangery, which mentions that the Fields purchased the house in 1996.